My third book, Nourish & Glow: The 10-Day Plan, is now out in the UK (it will be out in Australia on 18th April and later this year in the US and Canada). A true labour of love, this book is my most comprehensive yet, and I am very proud to finally be able to share it with you all. While I know that there is currently a backlash in the UK around the concept of ‘clean’ eating, I remain steadfast and passionate about helping people to understand what a healthy, enjoyable diet means for them – and hopefully for you, too. Empowering people to find a balanced diet that suits their own, unique lives, is so important for health, no matter what name it is given. 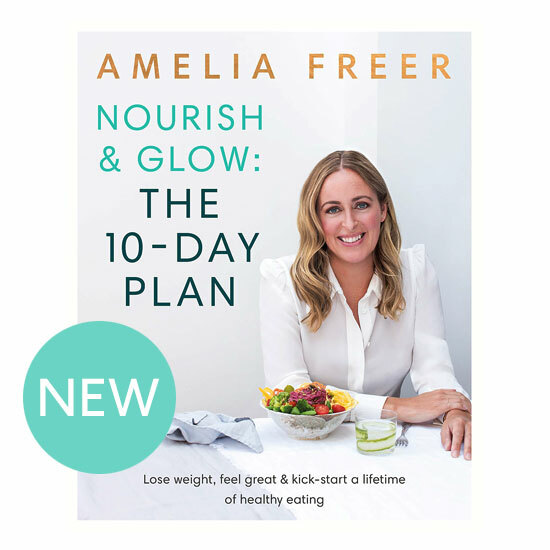 Far more than just a meal plan, Nourish & Glow: The 10-Day Plan is a detailed and beautifully illustrated guidebook, supporting you to build the strong foundations upon which you can make long-lasting lifestyle changes; from shifting your mindset and building your community, down to sorting out your kitchen cupboards and tackling common ‘trip hazards’. I have covered a lot and used my years of experience with clients to draw on. I am also excited to introduce you to the liberating concept of Positive Nutrition – truly the opposite of dieting. Positive Nutrition is all about what we should be eating, what our bodies need us to consume, rather than what we should be avoiding or restricting. For many, this can be a really empowering release from years of focus on deprivation and feelings of guilt around food. Plus, by getting to know and use a really simple new tool, the Positive Nutrition Pyramid, I hope it will also become clear about what this really means in practical terms and portions too. All of these core principles come together during the 10-day meal plan (with vegan alternatives for those that wish). This creates the opportunity to truly feel what it is like to plan, shop, cook and eat well for 10 days. With lots of new, simple recipes to try, the plan can either be followed to the letter, dipped in and out of, or simply used as a bank of novel meal ideas. Indeed, the whole book can be approached in the same way. I encourage my readers to engage with what resonates, whilst feeling free to adapt or even skip over the rest. It is your guidebook, and can therefore be used in whatever way you feel suits you best. There is, after all, no ‘one size fits all’ when it comes to good nutrition. But I hope that by working through this book, you will gain confidence in knowing what works best for you. Recipe taken from Nourish & Glow: The 10-Day Plan (page 262). This hearty and warming vegan chilli filling is a great recipe to have up your sleeve for those nights when you need a warming, healthy meal. It works well as a stand-alone dish too – just load up a bowl and add a handful of seasonal greens, or pour it over some brown rice for a filling supper after a long, blustery day out. I often make a big batch and freeze in portions – just double up the quantities and put some away for another day (which will also prevent you from being left with half a tin of beans looking sad in the fridge!). Click here for the full recipe. Recipe taken from Nourish & Glow: The 10-Day Plan (page 170). Making fish parcels is such a lovely, easy way to cook fish without the risk of it becoming dry. I make mine by lining the inside of some foil with baking parchment, as I personally don’t like to cook directly on to foil due to the concerns about aluminium leaching into the food. Salmon is a source of protein, as well as omega-3 fats. I try to buy sustainably caught wild salmon as I find that the quality of farmed fish can sometimes be harder to judge, although there are now a few more responsible suppliers available if you shop around. Click here for the full recipe. Recipe taken from Nourish & Glow: The 10-Day Plan (page 227). If you are not yet familiar with using bananas to make ‘ice-cream’, you are in for a real treat. Their texture once frozen and blended is like the most delicious, creamy sweet ice-cream you’ve ever tasted. The addition of nut butter here adds some healthy fats and plant protein, to slow down the release of fruit sugars from the banana. Click here for the full recipe. Please share your thoughts, feedback, questions and pictures of any of the recipes you make on social media using the hashtag #10dayplan – it’s always such a joy to see and share them. It is also available in Australia, Canada and the US.